Students and industry professional on site. Students and industry professionals on site. 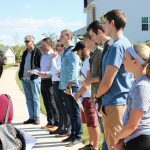 The 2018 Race to Zero competition has been hard at work over the past several weeks continuing to develop their zero-energy home design in collaboration with S&A Homes, one of the largest producers of homes in the central Pennsylvania region. 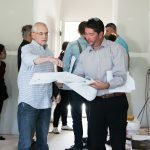 Over the past two months, students have met with Bob Shoemaker, Tech Services Construction Manager at S&A Homes, to learn about S&A’s process of design and construction in order to strategize ways to improve two of their house models. In late September, students had the opportunity to walk through a home being constructed at the site of the Landings Development in Ferguson Township, and see and discuss some of the design and construction details first-hand with S&A Homes’ Land Manager Tom Jacobs. 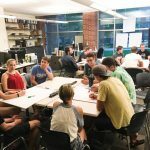 As the fall semester continues, students are learning architecture drawing tools and energy analysis tools to test the efficiency of the existing S&A Home designs as well as test their own design ideas. 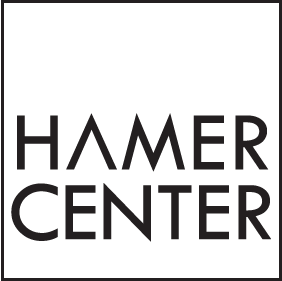 Team leaders Thomas Hanna and Sean Copeland will be presenting the work of this year’s team at the Hamer Center Coffee Hour on November 14th, and a Hamer Center open house in December will showcase the students’ work from the competition team. The Race to Zero competition is an annual student design competition hosted by the U.S. Department of Energy. Each year, student teams from across the world research, design, and document a market-rate, zero energy ready home, i.e., a home that produces as much energy as it uses. 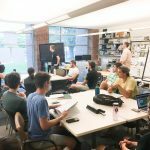 Select teams are invited to present their designs at the National Renewable Energy Laboratory (NREL) in Golden, Colorado. Penn State has competed each year of the five year old competition – winning several awards! The competition is meant to inspire the next generation of building professionals to design and build more sustainable and resilient homes. If you would like to learn more about the competition or join the team, please contact Thomas Hanna (tah5360@psu.edu). Anyone may join the team – no experience in architecture, engineering, or building is necessary! Developing concepts and strategies at the Hamer Center. 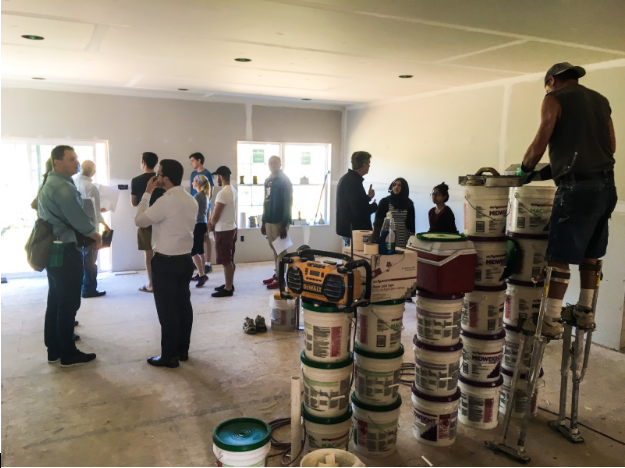 Students were able to tour a home under construction at the Landings Development in Ferguson Township. Students engaged directly with S&A Homes’ Land Manager, Tom Jacobs to learn about the design and construction process. Bob Shoemaker (S&AHomes) and Chris Hines (PHRC) discuss home design ideas. 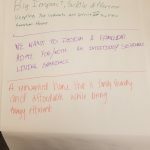 During Goals Development, the team created concept statement for what each person wanted the Home and the project to be in terms of architecture, technical systems, and livability.